CINCINNATI -- City officials are taking steps to make Downtown "smarter." 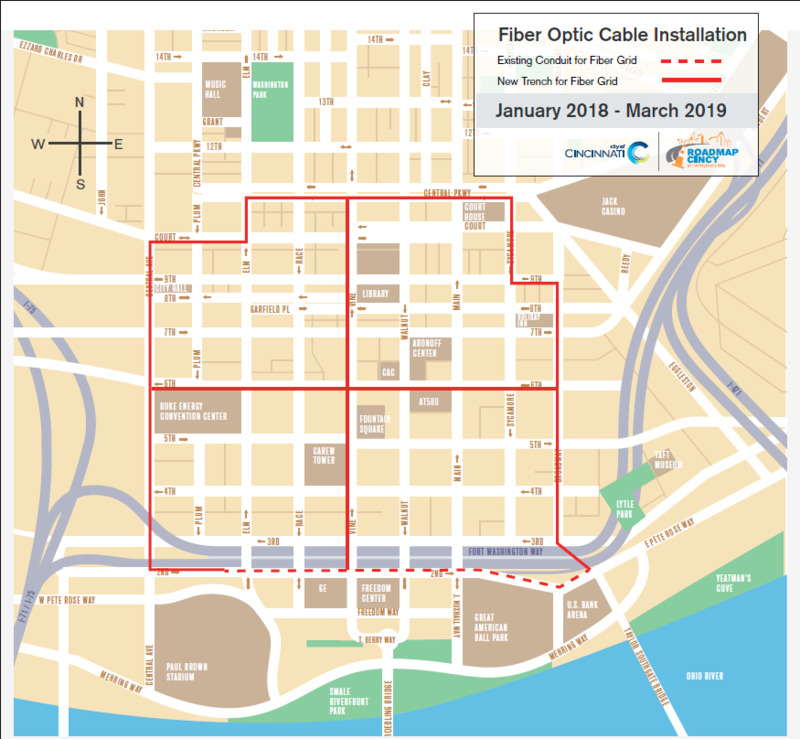 In a December memo to members of City Council, City Manager Harry Black announced crews will begin work to install roughly 20,000 feet of new fiber optic underground cable around a roughly 60-block perimeter in the Central Business District. What Black referred to as the "fiber ring" will extend from Central Avenue to Broadway and from Central Parkway to Second Street. It will replace the city's current analog traffic-signal control system, which not only coordinates signal timing throughout Downtown's often busy streets, but it also serves as the communication system for all city departments, such as public works and emergency services. The new system will mean new traffic video cameras throughout Downtown to help with traffic control and enforcement, Black said. It could also pave the way for free Wi-Fi downtown. Construction on the new grid will begin roughly as the Department of Transportation and Engineering wraps up a months-long study of Downtown traffic signal timing. As WCPO previously reported, it will be the first such study in more than 20 years . Typically cities will re-evaluate traffic signal timing every five to 10 years. The $9 million project will also mean 15 months of construction along Downtown's borders, but Black insisted the traffic impacts would be minor. "Crews will dig about 200 feet of trench at a time and restore each segment as it is completed," Black said. That work is set to begin in January 2018, although Black did not give a specific start date or location. The project isn't completely finalized, though. Its implementation will require the new City Council to approve roughly $1.3 million in city funds toward the upgrade to match about $7.5 million in grant money already promised. Black said the city's Smart Cincy initiative -- of which the new fiber grid is one piece -- will rely on the support of council and Mayor John Cranley in order to move forward. "Organizations, and especially local governments, that are not using technology and data to innovate and enhance the customer experience are destined for irrelevancy," he said. "The effort to continue to transform the City of Cincinnati into a truly smart city is simply not possible without the continued vision and support offered by the Mayor and City Council." Since starting as City Manager, Black launched in 2015 the new Department of Performance and Data Analytics -- an office that works to measure and streamline city processes and procedures. "The intent of the program is to have a cumulative impact of delivering better, faster and smarter services," according to the department's website. Black expects to introduce in early 2018 an ordinance that would approve the remaining funding.